There’s been a lot of talk lately about the huge federal budget deficit. Along with that talk has been a lot of confusing and misleading information – accusations of “out of control spending” by the right and “millionaire tax cuts” by the left. But what do the actual numbers tell us? 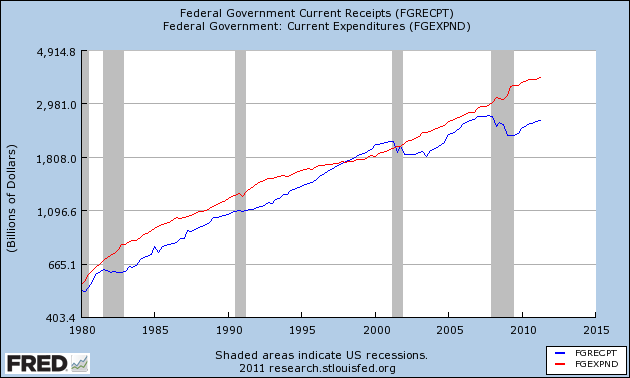 The red line shows federal government spending (expenditures), while the blue line shows tax revenues (receipts). The short term deficit is clearly a result of the huge drop off in revenues that started in 2007 when the economy went into recession. There was a bump in spending due to the Stimulus Package which is estimated to have increased the debt by about $825B but revenues are the main issue – and revenues won’t return to their previous levels until the economy fully recovers. Unfortunately, as I will comment on in a future post, it could be a several years before that happens. What’s also clear from this graph is that the longer term problems are the spending increases and tax cuts which began in 2001. In the years between 1995 and 2001 spending was kept in check while revenues grew – resulting in a few years of budget surpluses (Clinton with a GOP congress – a divided government success story!). Had those rates of spending and taxation been continued, the national debt would less than half of the current total and the government would be in surplus this year! Beginning in 2001, however, the rate of spending doubled to over 6% annually. This spending growth was significantly higher than GDP growth creating an unsustainable path destined to result in long term deficits. At the same time a series of tax cuts in 2001, 2003, 2004, 2008, 2009 and 2010 lowered tax revenues significantly. As a result, the effective tax rates today for all income levels are the lowest they’ve been in decades. The CBO estimates that, since 2001, spending increases added $5.7T to the national debt and tax cuts added another $2.8T. Together, these two additions to the national debt account for more than half of today’s total. In order to get back in balance, spending will either need to be cut drastically, or increases must be kept below GDP growth for several years. Considering the fragile state of the current economy, the latter choice would be preferable. Revenues will also need to return to higher levels. Most likely this will mean a tax increase in the not too distant future.